The arrangement of Variations (Op. 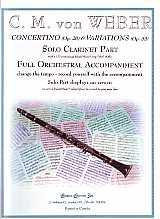 33) included here is for Clarinet and Orchestra of the same size and instrumentation as used for the Concertino (Op. 26) and both Concertos.